Half an hour after the railways announced it wasn’t certain the trains would go riding again after the storm last Thursday and that it would be wise to seek alternative transportation, I was on my bike to ride the 55 kilometres from my workplace to my home. The routeplanner of the Cyclists’ Union informed me it would be just over three hours at a speed of 18km/h. Five hours later I was home, ten minutes before the first train arrived from Utrecht in ’s-Hertogenbosch after all. 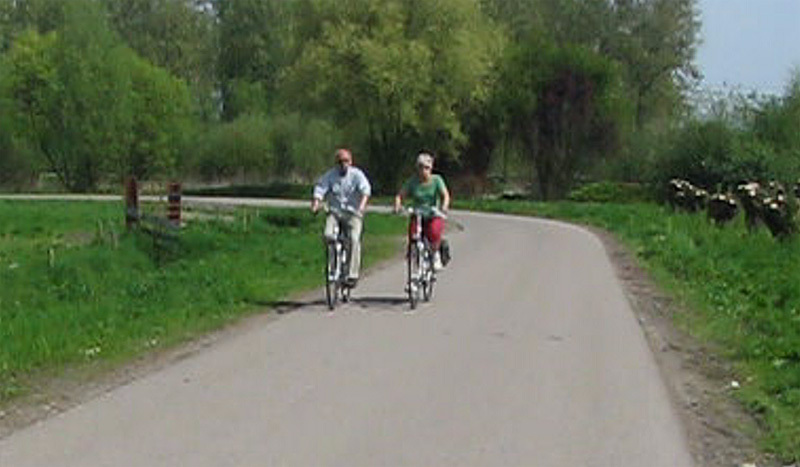 A cycleway between Culemborg and Geldermalsen in the province of Gelderland. Well lit, smooth and wide. 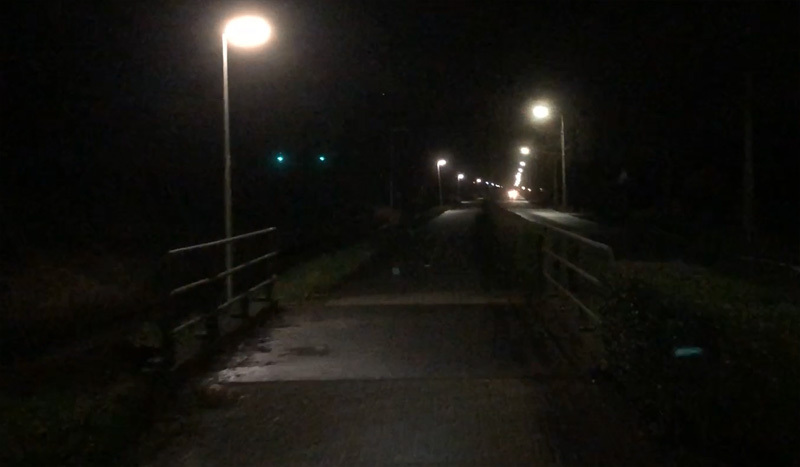 It is very easy to cycle on such cycleways, even in the darkness of the night. The storm on 18 January 2018 was of a category that takes place about once in a decade. The Germans named it “Friederike”, but – following Dutch custom – it remained nameless in the Netherlands. Sadly, the storm claimed three lives in this country. Since the storm only arrived in the late morning I had no problem reaching my workplace by train in the morning rush hour. However, when the storm hit it had a more devastating effect on the railways than at least I had expected. All over the country there were 344 incidents, including 97 trees on the tracks and over 20 locations where the overhead cables had been damaged. At least one of those power cables had already been broken around 9 in the morning on the line from Utrecht to ’s-Hertogenbosch, when I had just reached work. I had to go all the way through Houten from north to south. The signs sent me via the red line, but, accouring to the Cyclists’ Union route planner, I should have used the blue line in the north. Can’t have been a very big detour though. 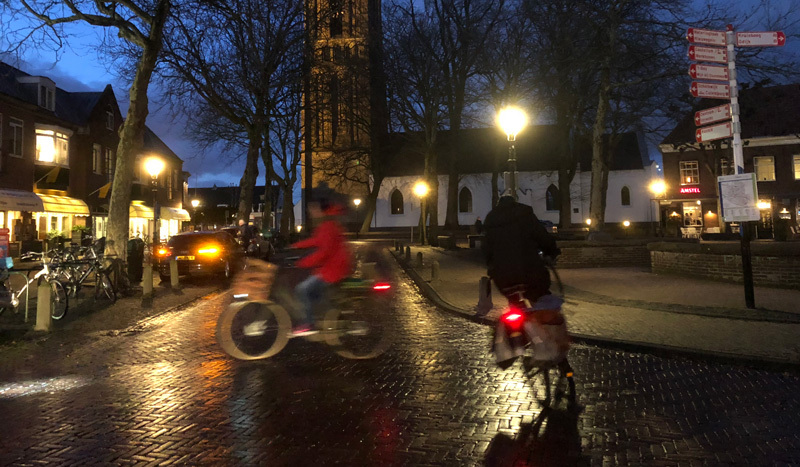 Houten, recently elected Cycling City 2018, I hadn’t expected to cycle here again so soon, on the main square of the old town centre! Was it careless to simply jump on the bike for such a long ride in the January cold? Maybe, but I – sort of – knew the way. I had done this before. Sure, the last time I cycled the return journey (110kms) on one day was in 2005, which is quite a while ago, but I had cycled in Houten very recently and I cycle in Culemborg quite often. I would also pass these stretches on this journey. I had my smart phone to check the route if necessary and I had a bottle of water and something to eat in my back pack. The wind speeds had decreased from about 140km/h (90mph) at the height of the storm to about 20km/h (12mph), so that would be doable, I thought, because I did know that the remaining wind would be in my face for at least the second half of the way. The one thing I overlooked a bit was the fact that it would be dark half an hour after I started my journey and that I had no puncture repair kit or a pump with me. The main street in Schalkwijk. It is a 30km/h road, but it is very narrow and that made it a bit unpleasant when cars were passing in the darkness. Even though the ones that did that night seemed to drive slow enough. This woman had cycled all the way from Utrecht too – on a folding bike! I last saw her on the ferry to Culemborg. The main street in Schalkwijk doesn’t look that bad during the day. Fortunately it is only 600 hundred metres like this, in the far distance there is a service street to the right of the water, where cycling can take place in a way that feels a lot safer. I knew the infrastructure would be good with just a few exceptions, but it surprised me to see that one of those bad stretches had been completely upgraded. 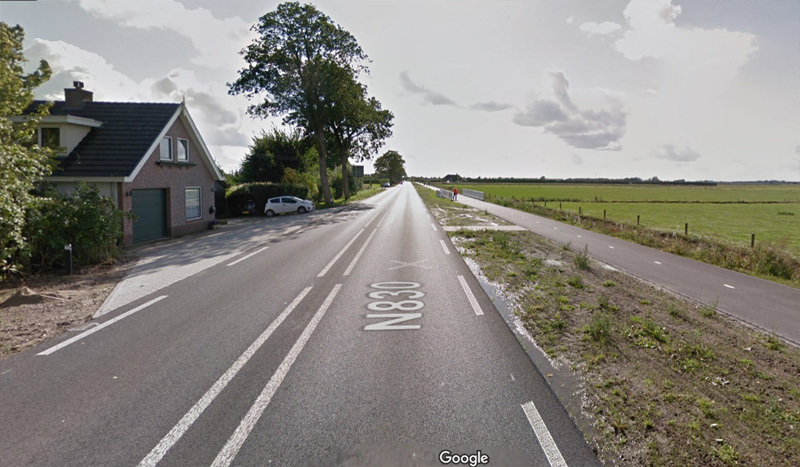 The road from Geldermalsen to Waardenburg used to only have cycle lanes. On street cycle lanes on an 80 km/h road is totally unacceptable under the sustainable safety policies and this has now been taken care of. The brand new bi-directional cycleway next to the new narrowed roadway had only been opened last September, by local school children. 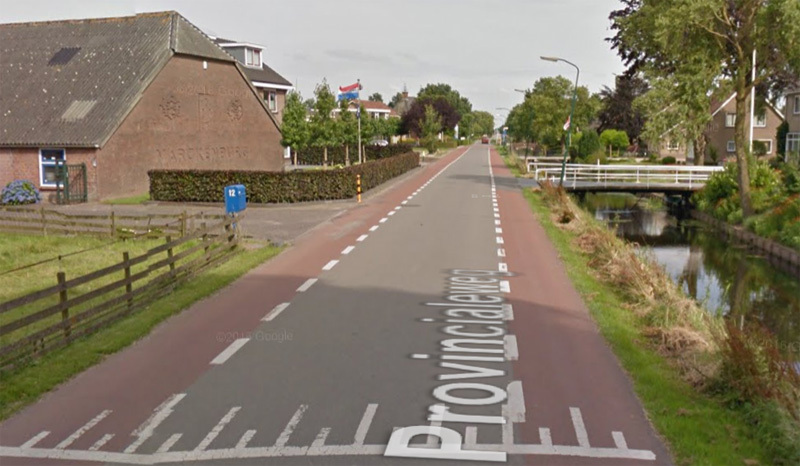 Another poor bit of infrastructure is the main road in Schalkwijk (in the municipality of Houten). For about 600 metres the road is quite narrow with on street cycle lanes. 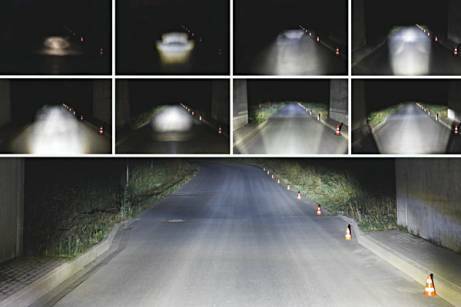 Even though the road has a 30km/h speed limit, drivers tend to go faster, especially in the dark. Fortunately you can cycle on a separate service street a bit later. 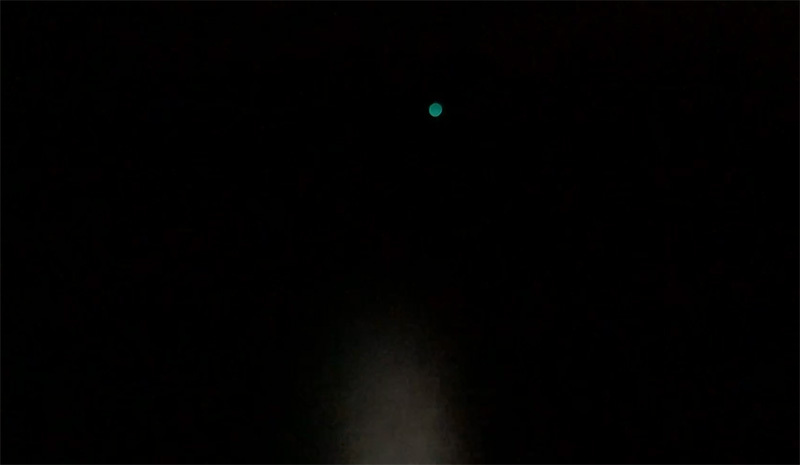 This road in the municipality of Geldermalsen was so dark that I nearly missed a turn and could have ended up in the ditch. For exactly 1 kilometre I could really only see the tiny bit of road that was illuminated by my front light. But for the moment when two drivers overtook me and their cars’ head lights lit up the entire road ahead for hundreds of metres. That tiny bit of green light is a train signal in the distance. The same road in Geldermalsen looks very attractive on a summer day. But turns like this can be very dangerous in complete darkness, as I found out. A still from a video I took here earlier. The scariest part in the entire journey was between Culemborg and Geldermalsen. That 5-kilometre stretch has beautiful well-lit bi-directional cycleways on either end, but those cycleways are interrupted in the middle for a length of 1 kilometre. That bit is in complete darkness. The road is so insignificant for motor traffic that you can’t even see it in Google StreetView. There are no lines on the asphalt and it has ditches on both sides. With several turns and even a side road it was quite demanding to find my way. I almost missed a turn. Just in time, I noticed that my front light was illuminating grass, not asphalt. That prevented that I ended up in the ditch. It was scary when I heard multiple motor vehicles approaching from behind. I even checked my back light just to be sure it was on. But that worked fine, and I was indeed seen. Both drivers were very careful when they overtook me. It was even nice to be able to see where the road went when the head lights of these cars lit up the road ahead of me for hundreds of metres. The A2 motorway bridge near Zaltbommel over the river Waal. I showed you what that looks like during the day in an earlier post. The cycleway from Culemborg to Geldermalsen. First I thought it was odd that so many lights were broken, but then I realised that exactly every other light was off. Must have been some measure to save energy. I showed you this exact bridge before, years ago. 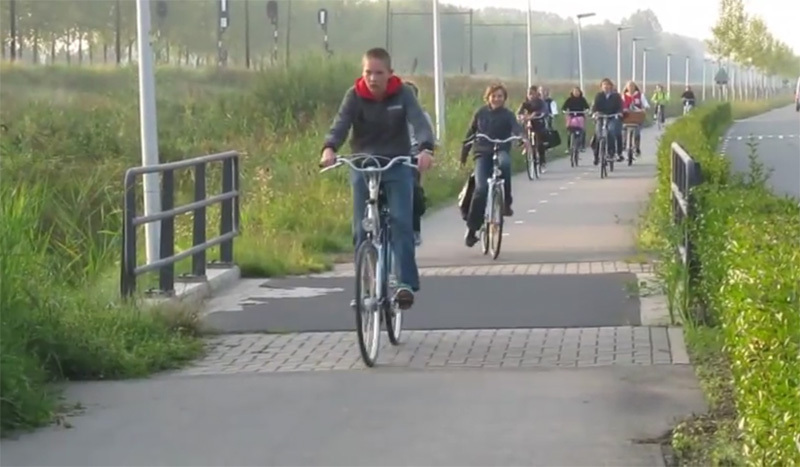 In my video about children cycling from Geldermalsen to their school in Culemborg. in the 55km unplanned evening ride in January. All the footage I shot during the ride (25:40 mins). You could watch it at twice the speed if you like that better. A lot of people wonder why I didn’t use a bus. The answer is simple: there is no bus service between Utrecht and ‘s-Hertogenbosch. Even many Dutch find that very hard to believe. But due to the special nature of this trip, through three provinces and crossing 5 rivers and a few canals, there are so many borders, administrative and natural, that there is no viable option with a bus. If you try to plan a bus trip on the journey planner of the Dutch public transport services and you request a bus trip, you get the answer that “no travel advice is possible”. Jitensha Oni has again analysed my ride in detail. Quite an achievement to study all this information for a 55-kilometre-long journey! Very interesting to see how much of the trip was on lit cycle infrastructure, to name but one of the details. Jitensha Oni compared this journey with a long trip in the UK on Twitter. 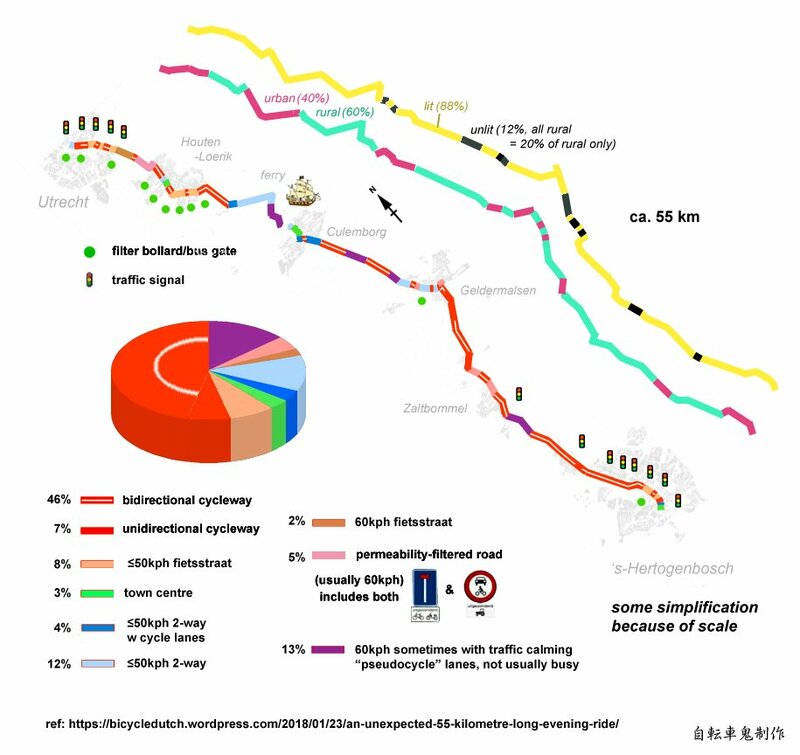 The chart by Jitensha Oni about my full 55-kilometre-long trip. That trip realy was an adventure! There are busses between our cities, but there is no logical route. I would probably have tried Utrecht-Vianen-Raamsdonk-Waalwijk-‘s Hertogenbosch I think, since I’ve friends along that route where I can stay if I get stranded and I know there are buslines between these places. On friday night after work,the day after the storm, Dirk and I could not cross the river because both bridges were out of order. We made a bargain, he would navigate us to the ferry in the pitch dark and I would pay the ferry. Because he had no money and I didn’t know the way. After 35 km and warm handshake we went our separate ways. Both having great story at the dinner table how we met a stranger on the bridge and cycled home together. CYCLING is so much more…..
What an adventure. It’s great that you’re able to do this instead of having to sleep under your desk at work or something. In the past I only cycled for short trips and used transit for longer trips, then there was a transit strike which caused me to have to figure out what was needed to cycle long trips. It turns out that just some preparation, a map, water, some snacks and some time and you’ll get there. On a nice day it’s more pleasant than sitting on a bus and you can stop and check out things along the way. Hope you had gloves on and your bottom wasn’t too sore the following day? Respect, in those temperatures. Chapeau! Hat off for your bicycle trip. I enjoyed watching your long version video. One thing I noticed and don’t understand is your narrow frontlight beam. I would highly recommend upgrading your front light. Personally I am very happy with my busch and müller cyo premium 80 lux headlight. I now even like the unlit bicycle lanes the most, because usually they are quiet and I can still see all I need to see on the side, and in front of me. Keep up the good work! Regarding the bus: I tried on 9292, skipping other kinds of transport, and the route it provides is taking the 401 bus Utrecht-Breda, switching in Sleeuwijk to the 121 Gorinchem-Kromme Nol, then in Kromme Nol to bus 135 Kromme Nol-Den Bosch, total travel time 2 hours. Glad to hear I’m not the only one who doesn’t manage the default speed of 18 km/h used by that routeplanner. I’m a bit of a plodder I guess, because on most excursions I average around 13 km/h. First row, second from the left is 30 Lux, you already see so much more than with the halogen headlight on the very left. 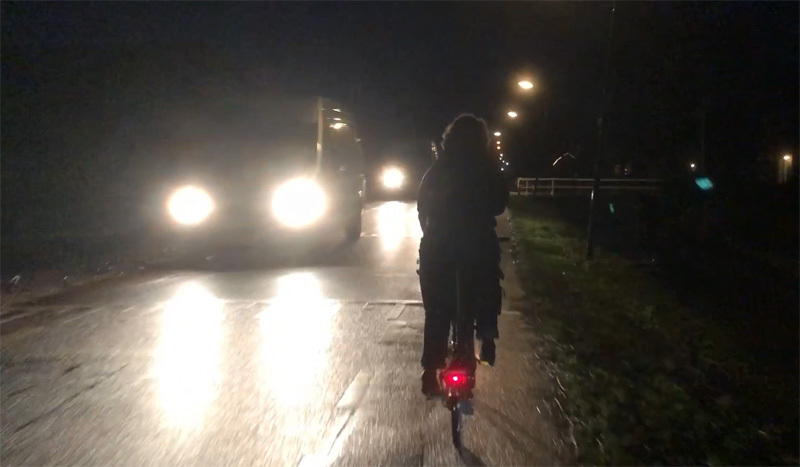 I often get caught in the dark on my outings but this modern dyno lighting has always brought me home safely, in places much worse for cycling than the NL. For visiting friends I ride Utrecht-Den Bosch regularly. From the map I can see you roughly took the same route. The good news on that route: there are plans to reuse the bike path of the old bridge at Vianen on the train bridge at Culemborg. That will reduce the travel length and offer a 24 h/day connection. There is also a more westernly route over Vianen that is not much longer. I use this trip always as example to show how complicated long-distance cycling in the Netherlands is. Just try to explain the route you took to someone else. You will fail probably without a map. Also inbetween the two cities your route is much longer than the route for cars over the highway. Your route follows sometimes more or less the railway but often does not. In short: from center to center is roughly 53 km by car and at least 57 km by bike. The difference would be larger if the large car structures around the big cities would not force detours for the cars. Where physical and administrative boundaries are problematic for buses, the municipalities still organise their cycling infrastructure to their local needs. Long distance cycling is structurally supported nor promoted. The era of e-bikes will hopefully improve this. Hi Theo. I don’t quite get your point and I must disagree. First the distance. Just try the ANWB car route planner and you’ll see it is 54.6km, versus 55km by bike. At such a distance that is a negligible difference. Then explaining the route. “From Utrecht follow the signs to Culemborg and when you are there follow the signs to ‘s-Hertogenbosch.” That’s not so hard I feel. The return trip is even easier, because signs to Utrecht are available all the way from ‘s-Hertogenbosch. We do agree that it is wonderful news that the old Vianen bridge (formerly attached to the motorway there) will be reused by attaching it to the railway bridge in Culemborg, because that ferry is a nuisance indeed! Did you actually use the signs? One missing sign can make you quit helpless when the surroundings give no clue. 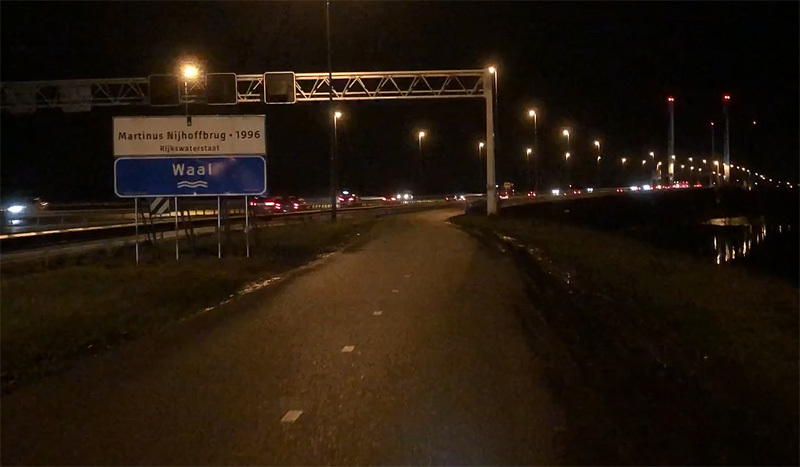 I gave up relying on long distance route signing after being lost countless times, also in Houten. 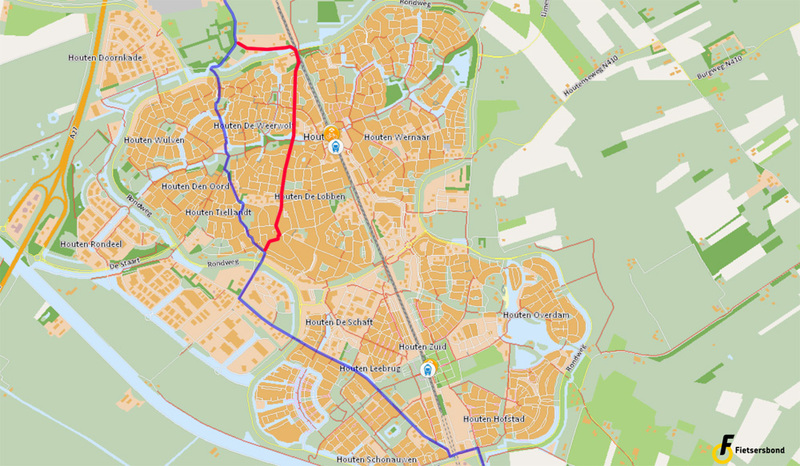 Now I stick to one single route through Houten. Without decent signing i is really a complicated route and incomparable with 50 km of highway surpassing all rivers, canals, railroads without knowing they are there at all. And yes, I was lost also somewhere around Wijchen when I went from Utrecht to Veno the first time. Just by looking at the shape of the track it is quit obvious that inbetween the cities (‘overland’) the distance is significant longer and much more complicated than following the A2. As I tried to say in my first reply: cyclists win back a lot at the rim of the cities where cars have to make significant detours. Nowadays I use always a track on my gps and try to memorize the critical points. So I’m well-prepared before I start. For me Utrecht-Overvecht to Den Bosch-Kruiskamp must be well below three hours to be acceptable (59 km). Even in my Quest that’s a hard target due to my route through Utrecht, Houten, the ferry at Culemborg, Geldermalsen. Full speed riding is only possible over a limited part of the route where there are no physical speed limitations for cars. Therefore I stay with my opinion that long-distance cycling is complicated and challenging. I told my wife about your posting. Her remark: its only 25 minutes by train. In that perspective five hours is a long time. You have my respect for doing it anyway! Awesome article. 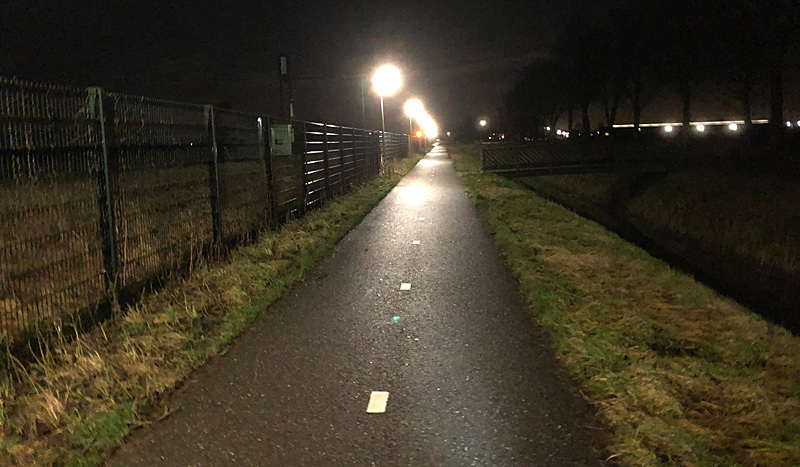 I often cycle from my work in Amsterdam Oost to Enkhuizen – about 60km, but then i do it on a racer with 600 lumens of front light and I think the infrastructure is even better in this part of Holland – or at least the lighting is good. I often only choose to ride when i know the wind is not going to be fully in my face. My best time was 1hr 55mins for the 60kms – with a vicious tail wind! Love living here and keeping fit in my late 40’s this way! Good for you to bike home. I am sure you had a good night sleep. Was really hoping you were going to say the wind was behind you all the way and you did it in record time then I read what happened! What an impressive ride though! Very reminiscent of my “positioning” bike rides between Wageningen and Venlo; I always got lost somewhere near Wijchen. I took detours around Nijmegen because cycling through the city was so awful. How times have changed. 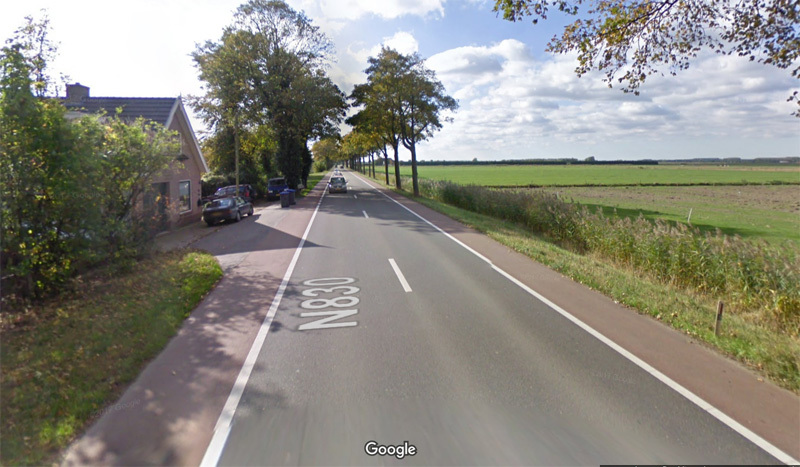 Remarkable… When I was a kid we used to ride often from Belfeld to Ede, to visit family. My dad always avoided Nijmegen, but we did get lost a few times around Wijchen as well…. 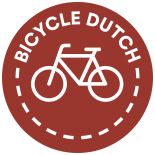 This entry was posted on 23 January 2018 by Bicycle Dutch in Original posts and tagged ’s-Hertogenbosch (Den Bosch), Culemborg, dark, Geldermalsen, Houten, long distance cycle paths, ride, Utrecht, Zaltbommel.